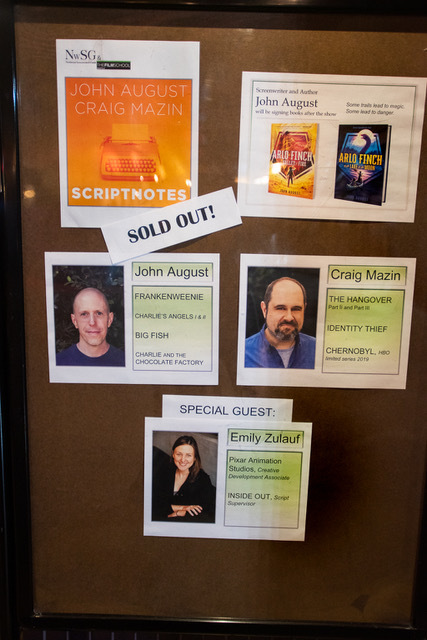 Literally years in the making, screenwriters John August and Craig Mazin finally accepted our invitation to record an episode of their Scriptnotes podcast in front of a live audience in Seattle. 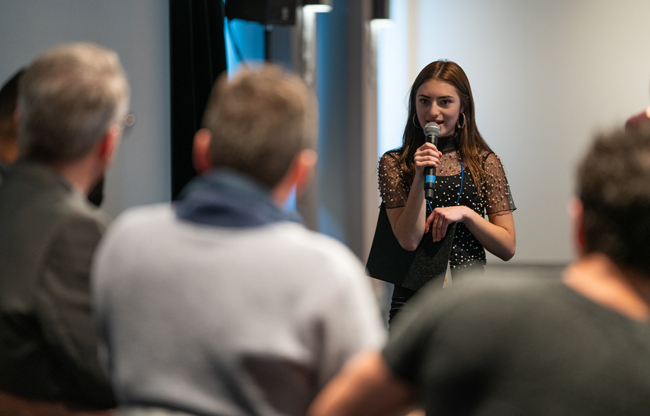 Some 200 screenwriters, filmmakers and actors packed the AMC Pacific Place theater for an evening of industry talk, screenwriting and story development tips, and a few fun exercises in pitching on the fly for open writing assignments. 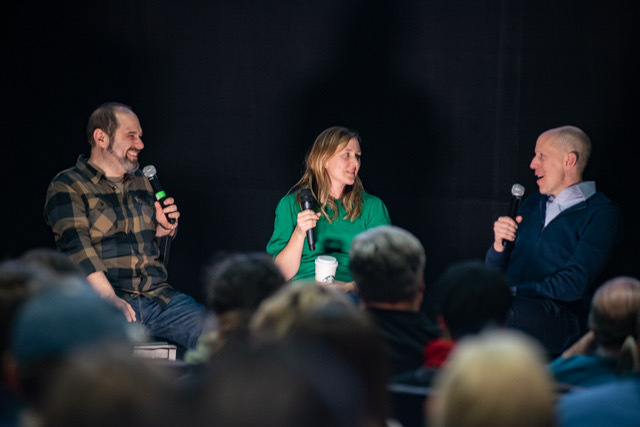 Joining John and Craig on stage was former Pixar story editor Emily Zulauf, who now works for a Seattle-based game company, which at the time of the podcast remained top secret. Emily spoke to how story development evolves at Pixar, and also to what she looked for in scripts as she was seeking screenwriters to work on Pixar projects. 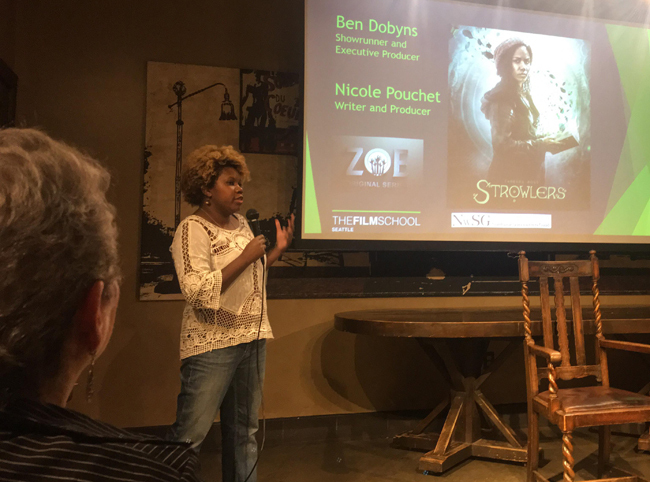 The trio also delved into theme — how it relates to a character’s wants, needs, and motivation — and provided tips on how to further the development of your story. 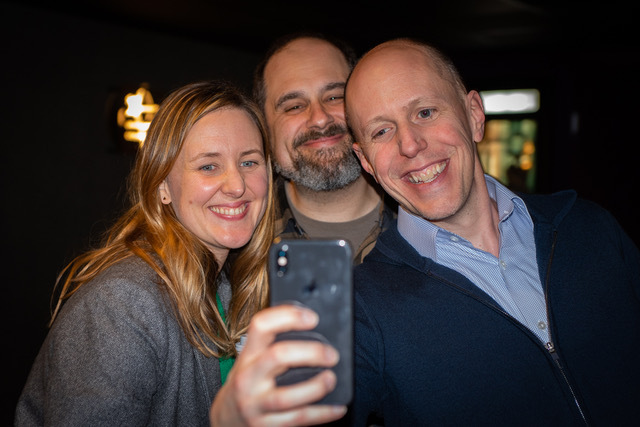 Episode 387 of Scriptnotes was recorded Feb. 6, 2019 in Seattle. Our members enjoyed a 50-percent discount off the general admission price. Learn more about NwSG membership benefits and see upcoming events. 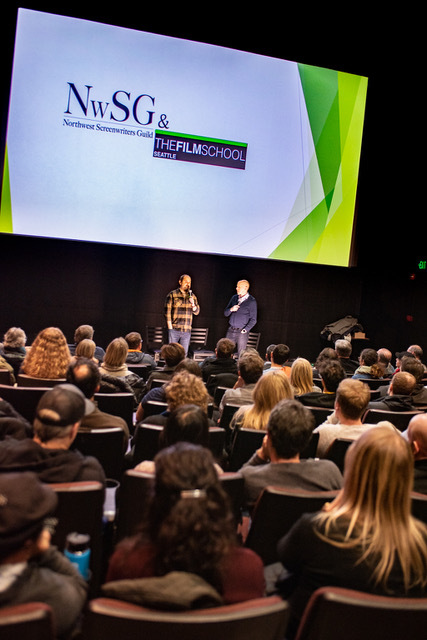 The Northwest Screenwriters Guild’s first “First Tuesday” event, co-hosted with TheFilmSchool and in association with the Tasveer South Asian Film Festival, featured a panel discussion led by industry professionals across multiple disciplines and covered multiple aspects of the process, from writing all the way through to distribution. Ask yourself if this project is something that you can stay passionate about for years because it takes a long time to make a movie. Having a writing partner can help keep you focus because someone else is depending on you. Structure your day. Find a time when you can write and just write. Write anything. Sometimes it won’t be good, but the good will come out. It is important to think about character and their relationships. The more you know them the more the script will flow when you write. When you attend festivals, find out where the parties are. Meet the programmers. Hang out at the filmmaker lounge. Network. Ask why this movie needs to be made. What about the movie is important to me, and will be important to others? It’s all in the preparation. If you prep well, you can shoot well. When filming overseas it is important to be there, but also to have local support to get the production done. For anyone new to Seattle, meet locals. You need to become a part of the community. Get to know people who can help you and who you can help. Films are only as good as the people behind them. Start with a small project before a full feature. Check withoutabox.com for festival locations. Submit to where you would like to travel to anyhow and where the locals want to see your film. Distribution has changed with technology. Filmmakers need to learn about creative distribution. Make sure that you have the rights for everything in your film. Shooting locations, talent, music, etc. If you want to get your movie into a festival, story is the most important element. Prioritize story versus expensive shots based on your budget and resources. A movie should make you feel. As an example the recent movie 8th Grade made her squirm because it really resonated with her. Send your film to lots of festivals, not just the big ones. Find your tribe. Maybe there is a festival just for your type of movie. When submitting your film to festivals, research the festival programmers for your genre. Make sure you get it to the right person. Tell them why the film is important, why someone would want to watch it, and who is the audience. If you have a connection, use it. Play up if you are an alumni of that festival or other festivals. Plan ahead when you know that it will be a premier, some festivals will only except films that have not yet had their premiere. The monthly First Tuesday events, free and open to the public, are held at Roy Street Coffee in Seattle. See the NwSG events and workshops page for upcoming topics.